In the past five years, Facebook’s organic reach has declined significantly – 2016 alone saw a 52% drop. Facebook Pages with over 500,000 “likes” have an average organic reach of 2% or less for each post, according to research from Social@Ogilvy reported by HubSpot. Similar declines are happening with Instagram organic reach, too. Given that social content promotion is now pay-to-play, here’s how to do it to get the best bang for your buck. Competition doesn’t directly dictate pricing on AdWords. The ad quality score does. 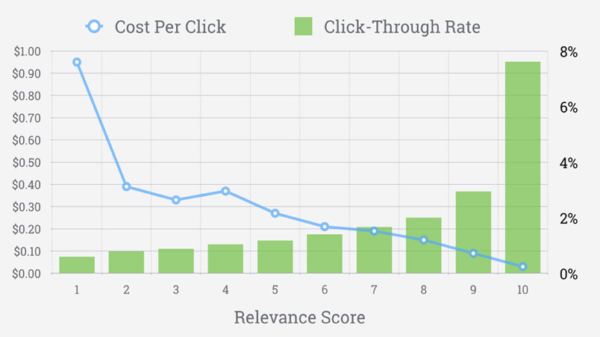 The same thing plays out on Facebook, where studies from AdEspresso have found that higher relevance scores translate to lower costs per click. 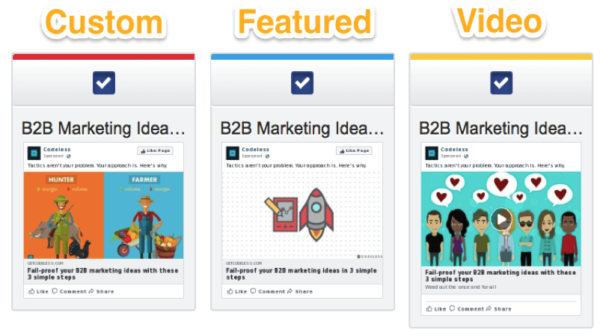 Picture your Facebook sales funnel. Some campaigns are designed to get attention (like the content promotion campaigns we’re talking about here). Others are designed to generate opt-ins or sales. The key to reducing costs (without sabotaging goals) is to make sure each campaign is optimized appropriately. The key to success (i.e., the best-quality clicks for the least amount of dough) is message match. For instance, a new, cold audience will have no idea who you are or why you matter. Trying to shove an e-book opt-in down their throats won’t work. Instead, you should match your pitch to their level of readiness, offering an easily digestible resource they just need to watch or click. Get one of those variables wrong and you’ll pay (in higher cost per clicks, visits, and leads). All else being equal, even a generic vs. look-alike audience can make or break your campaign’s costs (because the latter gives you a slightly more targeted audience). 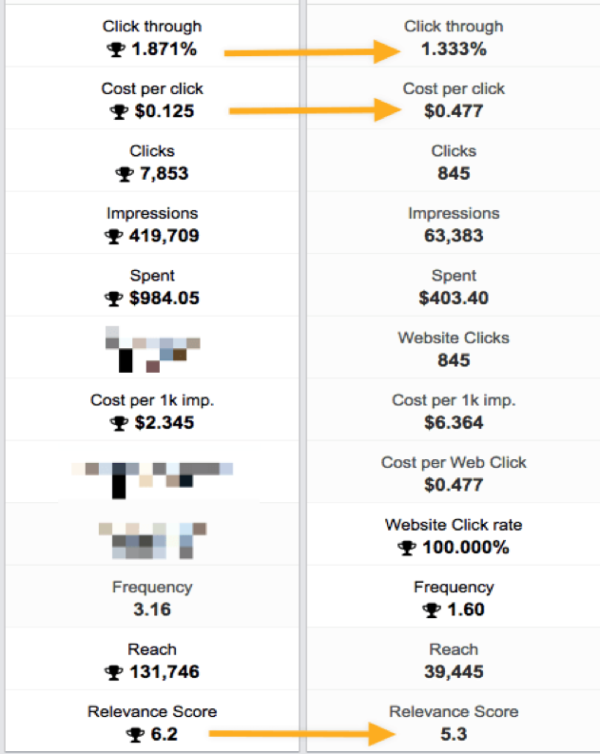 Paying 47.7 cents per click to promote content isn’t terrible per se. But only paying 12.5 cents for the same exact campaign (74% less) sounds a helluva lot better. Big consumer brands don’t have to “build an audience.” It already exists. Simply turn on retargeting ads and mint money immediately. Unfortunately, small or new brands don’t have this luxury. Most B2B brands don’t, either. That means for everyone else, top priority goes to audience-building first, before they ever try to convert a single lead. The silver lining? You can use whatever contacts you’ve got (customer emails, newsletter subscribers, etc.) to your email list and create a look-alike audience based on that. In other words, you can take your small, “warm” audience that numbers in the hundreds or thousands and use it to create a warm-ish audience in the millions. My company paid a contractor to compile a spreadsheet of contact information for our primary personas (in our target vertical). But this list only had around 2,000 people – not enough for a campaign. We used the data to create a look-alike audience with a size of 1% based on the original list (plus a few more look-alikes for site visits and Facebook post engagements) to bring our new audience sizes into the low 2 millions. A “1%” audience size relates to the percentage of the country population. You can go up to 10%, but 1% will include those who most closely match the original audience. This few-thousand-dollar investment gave us a few million, U.S.-based potential leads for a top-of-the-funnel audience. Creating look-alike audiences solves the problem of reaching enough people. The new challenge is to develop their interest in your content promotion. To avoid ad fatigue, habitually split test your ads. I don’t advocate A/B tests, which focus on small changes like the color of a button, because they often result in small or temporary changes. Instead, try split tests where you change big things (like a video vs. a custom image) to see budget-saving conversion lifts. Well, I can tell you which didn’t: the featured blog post image everyone relies on. It consistently cost the most (at over a buck a click). The other two often would flip-flop depending on the campaign. In one test, the custom image won out, coming in at less than 50 cents per click ($0.43.9/CPC). On another campaign, the video outperformed the custom image by about 30 cents per click. Marketing isn’t black and white, it’s all shades of gray. And the only way to see big changes (like cutting your cost per click in half) is to test, test, and re-test your assumptions. Online ad platforms are auction sites. They’re influenced by the same supply-and-demand fluctuations you learned at university. Facebook News Feed placements often come at a premium. They’re front and center, where people can’t miss them. That makes them great for conversion-based campaigns. However, they don’t make as much sense for content promotion for the same reason: You’re overpaying for what you need. Look at the cost comparison between mobile plus Messenger home costs vs. desktop feed plus right column costs for a content campaign we ran in August 2018. The mobile-based placements in red, blue, and yellow all have low CPC. Focusing the full content promotion budget on the mobile and audience network would have resulted in 2,000% more clicks (9,034 vs. 435) than a desktop feed and right column placement. Promote top-of-funnel content on mobile where the costs are a lot less. Then, retarget those people on better placements for opt-ins and conversions. The average Facebook CPC is around $1.72, according to Veronica Romney (via the Unbounce CTA Conference). That cost might be acceptable when you’re driving leads. You can easily do the math on cost or revenue per lead, and back out to see what you can afford to pay per click. But for content promotion? Not a chance. This is also why you don’t often see content-based promotion on AdWords: It’s cost-prohibitive (for what you get in return). If you first invest in building a real, engaged audience, you can use dividends from that effort lower in your funnel. We were able to drive middle-of-the-funnel views to our case studies and client portfolio for only 53 cents a click, which is about 69% cheaper than that Unbounce stat. That was only possible, of course, because of the few thousand dollars we’d spent on audience-building to get to this point. But at scale, over the long haul, the cost-per-lead savings more than pay for themselves. This last one sounds trite. But it’s not. The better your content, the less you’ll pay to promote it. 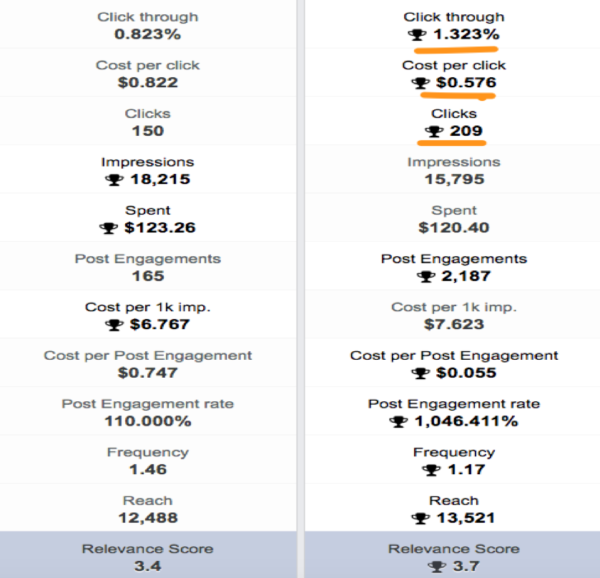 Why does one piece of content promoted on social perform better than the other? The promoted content included a long-tail keyword post (B2B marketing ideas), an in-depth case study (content writing services), and a first-person, contrarian post. Guess which one won? The first-person post that recounted painful lessons with a contrarian angle. Even though those other two campaigns weren’t as successful for social promotion, their value comes in driving search traffic in the long term and driving home your value to new leads who are on the fence. Different content performs differently. Some is mostly for SEO, while others are for stirring the pot on social. For your business, there is no simple answer on which content promotion would work better. It depends on your industry, audience, brand awareness, context, etc. But optimizing for better over the long haul can help you pinpoint the answers of what works and what doesn’t. 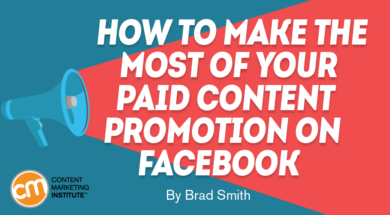 Facebook is still your best bet for social content promotion, but you must pay to play – even to reach your own fans. If you do it correctly, the expense will elicit greater benefits – giving you better data to work with, and eventually contributing to a decrease in the cost of lead conversions. The trick is to organize your campaigns around message match and prioritize audience-building. From there, you can routinely split test both creatives and placements to find the cheapest way to get clicks. And, don’t forget, better content is a must too. Promoting content is a great way to grow your content marketing success through social media. Another way to improve your content marketing programs is to attend the largest content marketing event in the world. Register today for Content Marketing World 2019 this September. Brad Smith is the founder of Codeless, a long-form content creation company that’s been high-lighted by The New York Times, Business Insider, TheNextWeb, and dozens more. Brad’s also the creator of Grammar Gang, testing the best grammar and plagiarism checkers on the market.